With More Rain Forecast, Crews Work To Reinforce Oroville Dam : The Two-Way Water damage to an emergency spillway on the Oroville Dam in Northern California prompted the evacuation of nearly 200,000 people from the area. More rain is forecast for the region this week. Water released so far by emergency spillways at Oroville Dam in Northern California washed away roadways, eroded the landscape and flooded communities downstream. In California, construction crews are trying to lower the level of Lake Oroville and repair emergency spillways at the Oroville Dam, about 75 miles north of Sacramento, to prevent catastrophic flooding downstream. A secondary spillway was opened Monday after the main spillway, which is supposed to safely release water when the lake level is too high, had developed a huge hole, as we reported. Rain is forecast for later this week in Northern California, and nearly 200,000 people who live downstream have been evacuated from the area. As NPR's Richard Gonzalez reported, "The good news is that the water level in the dam is falling and repair crews have been able to drop heavy rocks in key spots of the emergency spillway to prevent further erosion." For those who were evacuated, hotels in the region were filled to capacity on Tuesday and "evacuation centers are straining to keep up with the demand for shelter," Richard said. FEMA Acting Regional Administrator Ahsha Tribble said the agency is providing support to evacuated people, Ben Bradford of Capital Public Radio reported. "We are already moving commodities, and commodities being cots, blankets and water, given the number of people that were actually evacuated last night," Tribble said. 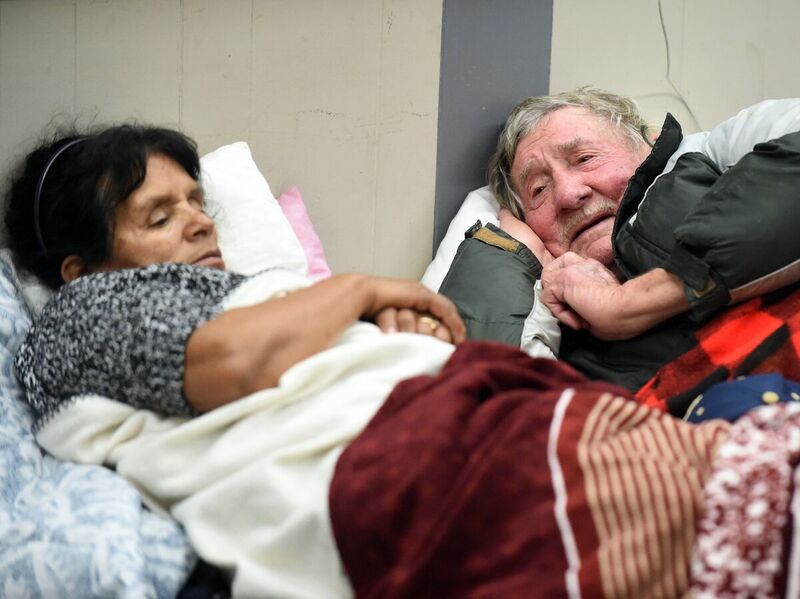 Evacuees Steve Allen and Alicia Castro lie on cots at the Placer County Fairgrounds evacuation center in Roseville, Calif. They are two of the almost 200,000 people under evacuation orders in Northern California Monday after a threat of catastrophic failure at part of the Oroville Dam. "Officials say a new series of storms coming by Thursday prevents them from saying how long the evacuation could last," Richard reported. The Los Angeles Times published this diagram of what that catastrophic erosion could look like. "Meanwhile, local reports are emerging that environmental groups raised concerns about the dam's emergency spillway decades ago," Richard reported. "State Water Project contractors, including the Metropolitan Water District of Southern California, were involved in the relicensing. MWD General Manager Jeffrey Kightlinger said Monday his agency deferred to the state and federal agencies on the matter." At 770 feet, the Oroville Dam is the tallest in the U.S. Although the structure hasn't suffered a catastrophic failure, the excess water dumped by a series of California storms and released through the spillways has nonetheless inundated communities in and around Oroville. Reporter Paige St. John of the Times tweeted a photo of a drowned cemetery in the town of Marysville downstream of the dam. 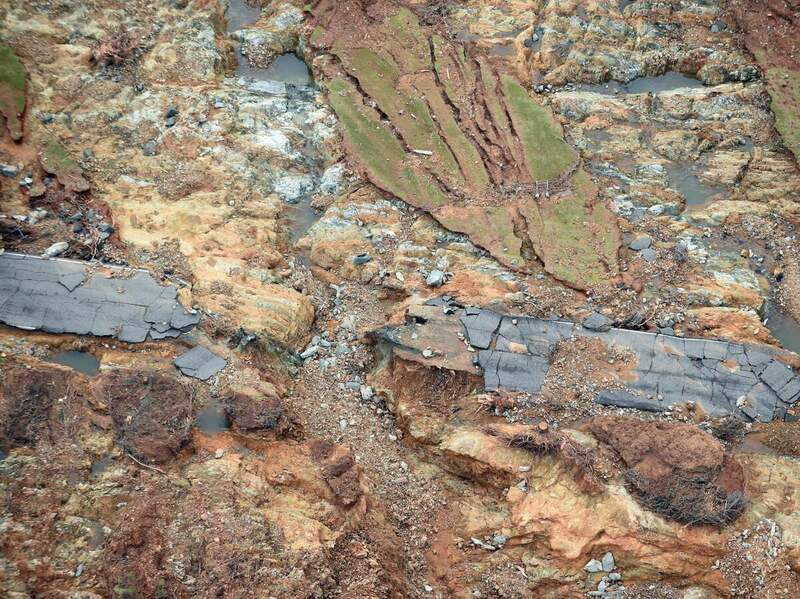 An aerial photo shared by the Long Beach Fire Department, which was called in from the southern part of the state to assist local authorities, showed water carving channels through the hills downstream of the dam, carrying mud and debris with it.